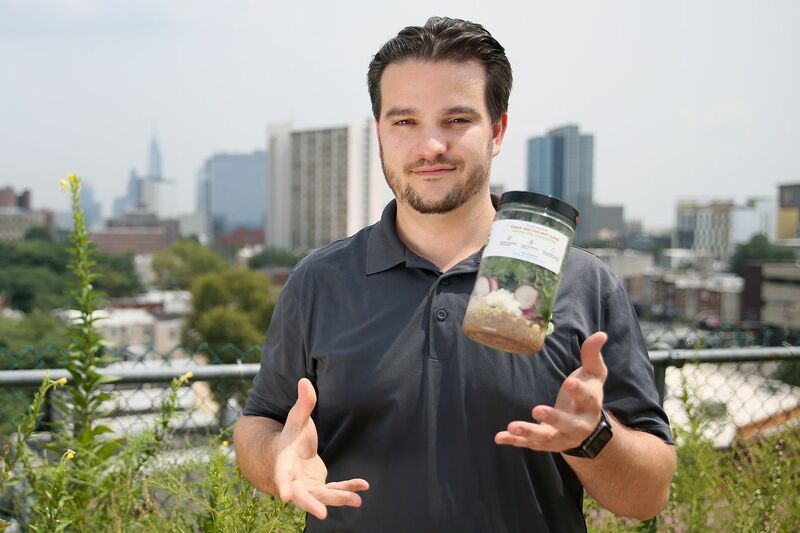 Simply Good Jars founder and CEO Jared Cannon on the green roof of the 1776 coworking space in West Philadelphia where his meals-in-a-jar company is headquartered. This year, we received nearly 100 applicants for the Inquirer's third annual Stellar StartUps contest recognizing some of the region's best new companies. And from them we have 30 finalists in nine categories. Before we get to that list, though, we offer a close-up of one finalist: Simply Good Jars, a West Philadelphia-based company whose initial product offering was so successful that it was just discontinued last month. But let's not get ahead of ourselves. Simply Good Jars had a long run-up to launch that should be appreciated. You could say it began 30 years ago, when Jared Cannon was 2, growing up in a food-obsessed Italian household in Newark, Del., and indulging an odd habit. "I used to just open the fridge and stare at the light and look at things," Cannon, now of Cherry Hill, recalled recently with a laugh. His mother, he said, also "has pictures of me at 2 or 3 on a step stool making pasta on the counter." At 15, he was cooking Christmas Eve dinner for the family. Little wonder he wound up at the Culinary Institute of America in Hyde Park, N.Y., graduating in 2004 and spending six years in South Florida working for Ritz Carlton hotels while simultaneously earning a bachelor's degree in hotel/restaurant/hospitality management from Florida International University. After graduating from there as an executive chef, Cannon went to work in restaurants and food retailers in Charlotte, N.C., and then in and around Philadelphia, for Iron Hill Brewery, Honeygrow, Tria, and Di Bruno Bros. While cooking, he also earned a master's degree in innovation and entrepreneurship from Temple University's Fox School of Business with the aim of starting his own business. The "slim margins" and overall challenging conditions of the restaurant business prompted him to reject that option. Instead, he pursued an idea for packaged meals inspired by salads in mason jars that he saw promoted online as a do-it-yourself lunch option. His idea was for a full-blown commercialized business. First, he needed money. Cannon applied for and got a $1,000 loan from Kiva.org, an online crowdfunding lending platform, and, he said, "Simply Good Jars was born in November 2017." Using the Enterprise Center's commercial kitchen in West Philadelphia, Simply Good Jars debuted as a subscription service: $26 for three lunches (salads in a jar containing protein and healthy fats, with ingredients sourced from local farms) delivered to a customer's workplace on Mondays and able to stay fresh for five days. Soon, the service expanded to five lunches and five breakfasts a week, and Simply Good Jars "grew a waiting list of 750 people in a month," too much for a two-person business to handle, Cannon said. Simply Good Jars meals are sourced from local farms and all 600 calories or less. He limited the active customers list to 100 at any given time and restricted the delivery territory to Center City. Another unanticipated result is how much participation the company got for its social mission of feeding the needy. For each jar a customer returns for recycling, Simply Good Jars contributes a meal to Philabundance, the Philadelphia-based nonprofit food bank. "I thought maybe 50 percent of these people would be returning these jars to us," Cannon said in a recent interview. "It was literally 99 percent, which was crazy, right? It was awesome. So, I felt like we had something. Not only do we have a wait-list, we had people going out of their way, holding these things for a whole week to give them back to us. And that, to me, kind of solidified this idea that we were on to something." Still, Simply Good Jars wasn't really what Cannon had planned. "This was always the plan," he said, reaching over and patting a refrigerator stocked with jarred salads in the common area of 1776, a coworking space in University City that serves as Simply Good Jars' headquarters. "This idea that healthy food options were needed drastically in the places where life happens and time shrinks." In other words, the workplace. At the 1776 coworking space in University City, Carina Daniels, a media-relations specialist for Cater Communications, makes a Simply Good Jars meal selection: a truffle mushroom salad. "There's just not a convenient, easy, tasty, healthy food option, and this was the way to solve that," Cannon said. The unit in 1776 — the only one currently operating in the market — is not a basic refrigerator, but a high-tech one that functions like a hotel minibar, sensing what is removed by weight. Payment — full-size jars are $9 to $11 each; breakfasts/snacks, $6 — is made by scanning a credit card or the payment app Venmo. Nothing is more than 600 calories. On July 3, he pulled the plug on the subscription service, which had generated about $20,000 in revenue in eight months. It "was just a way to get product in people's hands, get some feedback, start making a little bit of cash … start at least paying for what we needed," Cannon said. "Subscriptions were a hit. It was a really hard decision to cut those off. But, it was never something that was scalable or effective from a business-model perspective or profitability, but it did allow us to get to where we are today." That's a company with eight full-time equivalents and a five-year plan to have 2,000 refrigerators generating $2 million in revenue a month. The vending units will be at three levels of technological sophistication, including a version, Simply Smart Fridge, with Siri- and Alexa-like voice-activated capability to enable more personalized service, such as directing a customer to the shelf containing gluten-free meals. The company is in talks to place some of those units at Drexel University, Philadelphia International Airport, the Navy Yard, and Penn Medicine, Cannon said. Simply Good Jars has raised $265,000, closing in on a $500,000 goal by Labor Day, he said. After that, a fund-raising round of $1 million to $1.5 million is planned, which would enable expanding the service area to the entire Mid-Atlantic region, Cannon said. "It was really founded on this idea of eat well, feel good, waste less," Cannon said, recalling a sickening amount of waste he observed while working in restaurants "and then literally walking past people on the streets begging for food and money," something that made no sense to him. "I knew if I was going to start a company, it was going to be not only a business that could be for-profit but a business that could also scale the impact that we were able to make," Cannon said. The following is the complete list of 2018 Stellar StartUps finalists. Winners in each category, along with a grand-prize winner, will be announced Sept. 13 at a gala and networking event at South Bowl. To register to attend, go to www.philly.com/stellarstartups.